Naja Killebrew is the founder and CEO of Media Culture Marketing and Public Relations. She’s a dynamic and skilled professional, who has a wealth of experience working with stakeholders and community members of all backgrounds. In a recent interview, Naja shared her tried and true strategies for meaningful community involvement, as well as why she loves her work so much. What is the scope of your current work with Indego? I started out as the Marketing Manager at Indego. When I left, I started my own marketing and consulting firm. 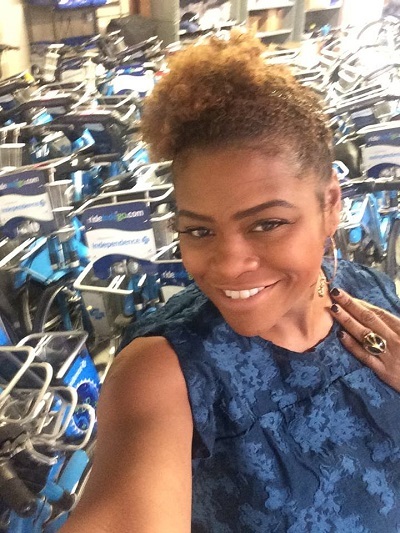 Indego contracted me to continue to do their marketing and community engagement. 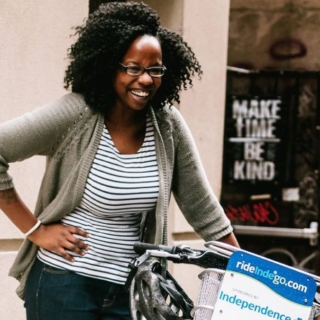 I work very closely with the team at Bicycle Transit Systems to deliver quality marketing and engagement campaigns in the Indego service area. They continue to raise the bar on equitable bike share in the Philadelphia market. The City of Philadelphia and the oTIS team gets it. They are out and about at community events and to see first hand what is needed. They don’t sit behind their desks making decisions without community input. I’m grateful to have a client as committed to equity and inclusion as Indego. It should be the norm but unfortunately it isn’t. I have also worked with the Mayor’s Fund on strategic partnerships. We work on marketing materials, videos, and on connecting with community members about what they would like to see out of the system. That way we determine what type of messaging and marketing is needed. Our goal is to create an equitable bike share system and with that our marketing and communications must be equitable, feature the diversity in our city and ridership, and send the message that Indego is for everyone. What other kinds of contracts do you work with? I’ve carved out a niche for myself with the work that I’ve done with Indego. I mostly work with nonprofits in the Philadelphia market who are trying to reach a demographic that they may not be as educated about. The nonprofits that I work with are mostly based in a community that they want and need to reach but may not know the best way to do so. For example, one of my contracts is with the Discovery Center in Strawberry Mansion. I work with them on community engagement in Strawberry Mansion and surrounding neighborhoods. It was important for us to connect with leaders and community organizations to gather information and disseminate information. Community engagement is not an easy task. It takes patience and a willingness to listen to what the community needs and wants before planning programming and events. I truly enjoy working with the Discovery Center team. They have become like family. Water reservoir in Fairmont Park. Source: Alliance for Watershed Education. The Discovery Center is built right next to the East Park Reservoir, which is owned by the water department. When they didn’t use the reservoir anymore, it filled up with water and hundreds of birds migrated there each year. 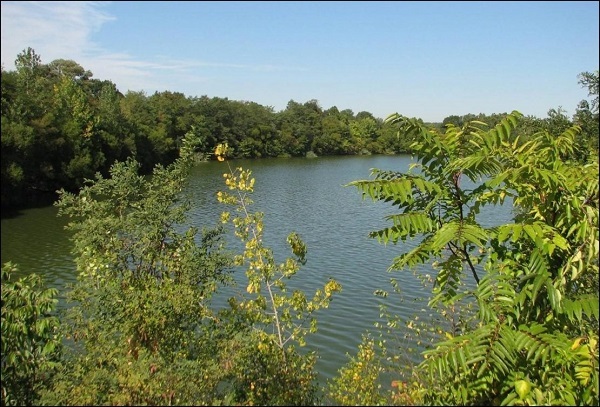 It was overgrown with trees and all kinds of plants, and the Strawberry Mansion community used to hike, picnic, and swim there. It was a staple in the community. Then the reservoir started to become a little dangerous. They put a gate around it so people couldn’t swim in the water anymore. Later, the City and funders got together and created the Discovery Center, where people from all over the city can come and enjoy the center and surrounding area safely. We worked with Audubon Pennsylvania, Outward Bound, and the Strawberry Mansion CDC on programming, marketing, communications, and community engagement, so people could safely enjoy the center. We also did a groundbreaking of the center on September 28th and 29th. It’s been amazing to see that the community is embracing the space and looking forward to the programs, events, as well as simply discovering themselves in nature, which happens to be right around the corner! The other client I’m working with is Awbury Arboretum, which is located in Germantown. They have some great events, but the community members right around the corner don’t always come. We’re doing market research, community engagement, surveys and focus groups to learn more about why. This project is very special to me because I’m from Germantown. I have some very special memories growing up and enjoying Awbury events as a child. Our goal is to figure out how to make the local community feel more invited, welcome, and excited to explore all of the fascinating education, arts and culture, events, nature, and programs at Awbury. We’ve gotten great feedback so far and look forward to implementing some of the suggestions that we’ve gotten from the community members. The Awbury team is committed to the process and we’re excited about the level of engagement and support we’ve received up to this point. Our community outreach and engagement is working! There is a noticeable change in the diversity of the community members who have been attending events. I must add that community outreach and engagement, marketing, and research takes money. Many nonprofits just don’t have it in the budget. They need funding. I’m very thankful that the William Penn Foundation is giving us this opportunity. We probably would not be able to make these strides without them. Why are you passionate about strategic communications and other communications work? I believe that every organization, for the most part, wants to be equitable, to have equitable programs, and to reach a diverse population. I don’t think most organizations leave people out on purpose. The optimist in me has to believe that. For me, the role is to be a bridge, to connect those who don’t have their voices heard with the people who want to reach out but don’t know how. The end result can be a beautiful project, program, or building. That’s the best part of what I do! It’s like being a translator. But then we also come into difficult situations sometimes when people feel they’ve been ignored for too long. When you go to reach out to them, they feel defensive. You have to build trust, and that’s a hard process. It’s hard when they feel undervalued. But when it works, it’s a beautiful thing. And more often than not it works. I also educate organizations about equity. A lot of times equity is not at the forefront. I always say, “Equity is the fabric, not the fabric softener.” You can’t finish a project and then say, “Let’s sprinkle a little equity in.” It has to be a goal from the beginning of the project. It’s also important to invite the community to the table. The community is a part of your team. You want them to be a part of the decision-making process. That’s how you get buy-in from the community to make sure the program and the events are successful. It’s just about education. It’s a lot of fun but challenging at the same time. In your opinion, what are the biggest challenges facing cities, system operators, and community groups as they navigate how to best learn from and engage communities? It’s a lot about collecting information. A lot of people come in with a solution, or come in trying to find a problem. You have to go into a community and find out what the needs are. You have to embrace them. You have to ask what the community needs, not tell them. Then you’re more informed and that helps everything. It builds buy-in and trust. You should continue to keep them engaged in every step of the project, from dream to end. And when the project comes to fruition, the communication has to stay open. Use email blasts, town hall meetings, and other avenues to keep it going. What to you do when you talk to a community and they say what they need isn’t bike share but jobs, public safety, or better schools? Bike share isn’t always the solution to the problem, but it can help. Maybe the community is more interested in education, but bike share can provide an affordable way to get to schools. We work with education systems and schools to see how we can assist them. We can’t always solve the whole problem, but we can address it and find ways to help, using bike share as a tool. With health, for example, while we can’t fix high blood pressure, we work with doctors to improve fitness through cycling. Jobs are important too. 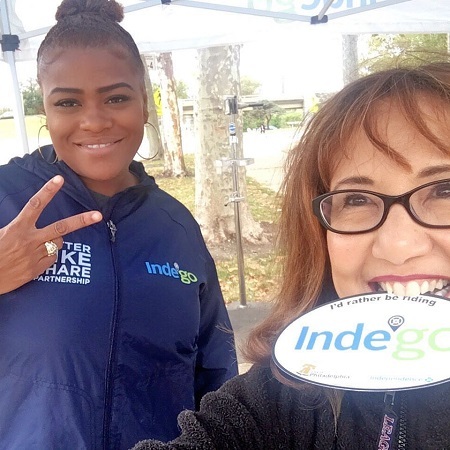 With Indego, when they have jobs that are available, they distribute the posting to community organizations. It’s on our website, and we submit it directly to the community organizations. A lot of times hires come from the community, as well as members of the street team and volunteers. I’m also proud of the Indego mini-grant program, which provides a stipend to community organizations, where we work with them to throw an event. They get the funding to help make it happen. Then we are there at the event offering bike rides, chotskies, helmets, and information. Other partners may provide resources as well. I learned a lot from working with Carneshia Kwashie, former grant manager for the Mayor’s Fund and Waffiyyah Murray, the current Better Bike Share program manager. They both lead with equity as the focus and find creative ways to address community challenges. It’s always good to have a great team around you. Speaking of partners, what partners do you turn to in doing your work? We work with Drexel University’s Dornsife Center for Neighborhood Partnerships, as well as High Heels High Hopes, which is a nonprofit that works with young girls to help empower them, love themselves, and build self-esteem. We also work with Cancer Who?, which is an emotional and mental support organization for cancer patients. Give and Go Athletics looks past the basketball courts to promote mental and physical health. And Strawberry Mansion CDC hosts rides, posts information at their center, and promotes the Indego Access Pass, which is one thing we are very proud of. It allows anyone with a Pennsylvania Access Card to get a pass for a deeply discounted rate. For a few years our marketing focused on growing the Faces of Indego campaign and highlighting the diversity within our ridership. This year we worked with community papers, iHeartMedia, Temple radio, Billy Penn news, Pandora, and a host of other media partners to send the message that Indego is for everyone! This year we’ll continue our equity focus, but we have something new and exciting in mind. I think people will be happy about it. We will always involve community riders and this year we are partnering with Art-Reach. Their Access Admission program provides access to more than 30 arts and culture institutions in Philadelphia. Anyone on any type of assistance can take their families to these institutions for less than $5 with a Pennsylvania Access Pass. Our partnership with them has been invaluable to raise awareness about the pass. I’m looking forward to working with Art-Reach to help people affordably access Philadelphia’s rich arts and culture scene. Anything else you’d like to share about your work? I really love what I do; you can’t even imagine. It makes the community feel so good when they see the City come out, from supervisors at oTIS to bike share operators and partners involved with Indego. They all come out. It’s not that we just send the street team; you’ll see people from the whole city. That makes the community excited, and we’re hoping they see us as members of the community as well. The Better Bike Share partnership has done an outstanding job of providing platforms for difficult conversations, education, and awareness. I’m thankful for their commitment to breaking down barriers to make bike share equitable and to enable effective engagement in our communities. Partnerships are what makes Indego so special. 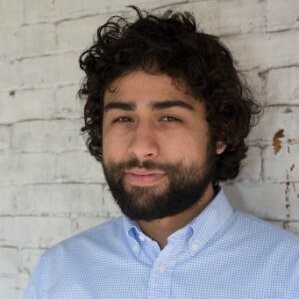 Indego marketing will always be community based. After all, it’s about people. 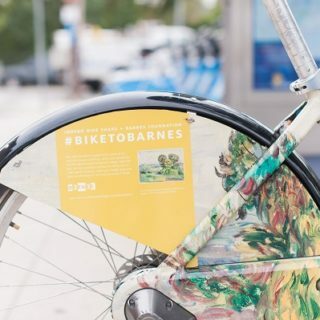 Uniting, assisting, encouraging, empowering, and connecting communities through equitable bike share is the way to go! Happy riding!